Does someone you know love the color purple? 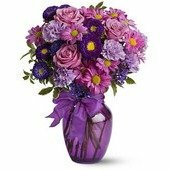 If so, they’ll love this enchanting bouquet of fresh flowers in royal hues of lavender, lilac and violet, all dressed up with a purple satin bow! It’s a charming way to display your everlasting friendship.